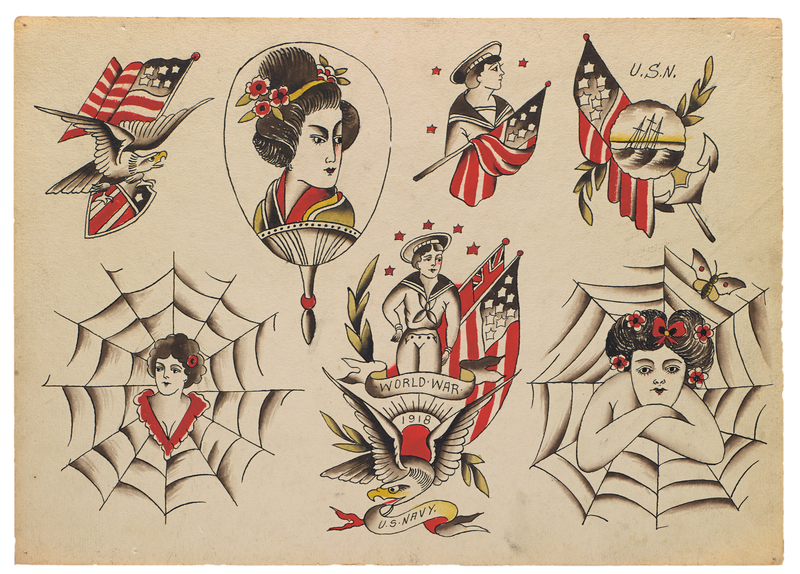 The pieces in Vintage Tattoo Flash come from the last century, but the highest concentration of work is from the 1900s to the 1960s. They represent much of the familiar iconography of American tattooing: ships, half-dressed women, birds of prey, panthers, daggers, roses, and, yes, hearts emblazoned with mom. What’s fascinating to see, by leafing through Shaw’s collection, is how the art form has evolved in the last hundred years. 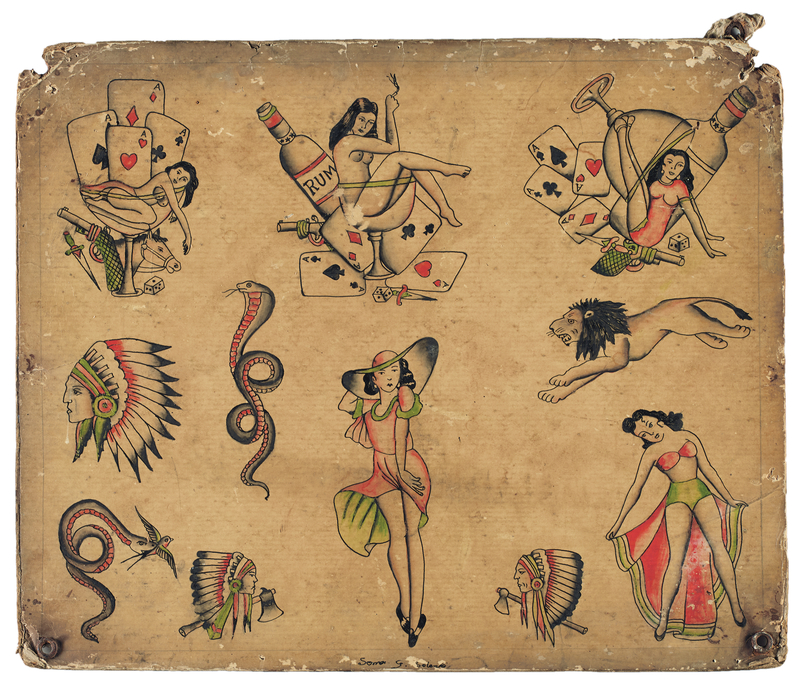 By the 1950s and ’60s, the Sailor Jerry–esque American traditional designs begin to shift into different territory, influenced by other styles of tattooing: a touch of traditional Japanese here, a hint of realism there. 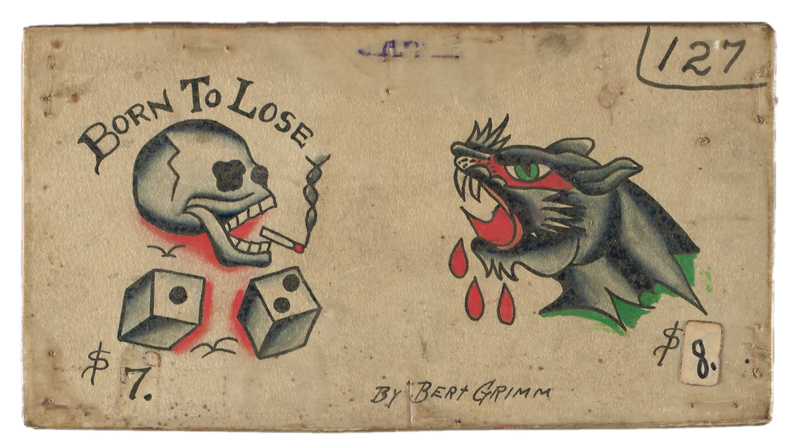 As Shaw writes in the introduction, “tattooing has long been a mobile art form.” Vintage Tattoo Flash makes the souvenirs it has picked up along the way evident. It’s not Shaw’s first foray into the publishing world. In 2005 Shaw sold the shop and packed up his tattooing gear to focus on writing, and now splits his time between Los Angeles and tooling around on a motorcycle in Rio de Janeiro. In 2015 Harper Collins published the first trade edition of his novel Narcisa: Our Lady of Ashes, with an introduction by No Wave musician Lydia Lunch and blurbs by former clients Johnny Depp, Jim Jarmusch, and Iggy Pop. Later this year, he plans to publish a several-volume-long collection of his memoirs, titled Scab Vendor.